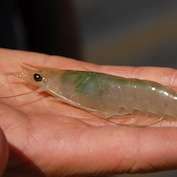 Researchers from Murdoch University, led by Professor Neil Loneragan and Dr James Tweedley, have joined the latest effort to boost prawn populations in the Swan-Canning estuary. It's the next phase of a wider program, which has already seen researchers at the Challenger Institute of Technology successfully culture juvenile Western School Prawns (Metapenaeus dalli) in a laboratory. Dr James Tweedley, a post-doctoral research fellow, said the team is now trying to determine how well laboratory-raised prawns would survive in the estuary. "By evaluating current prawn stocks in the Swan-Canning estuary, we'll be able to determine which parts of the river are most suitable for prawns," he said. "We need to find out what environmental factors drive their abundance, and how tolerant the Western School Prawn is to different environmental conditions." Experts say algal blooms can lead to a hypoxic (low oxygen) environment, something which crustaceans are very sensitive to. "Fortunately, the Swan-Canning estuary is healthier than it has been in a while. The management has improved, people are now more careful with fertilisers and there are fewer algal blooms," Dr Tweedley said. Researchers are surveying a number of locations for prawns, including Melville Water, the Narrows Bridge, the Canning Bridge, Point Walter and Deep Water Point. Professor Loneragan said the Murdoch team will also evaluate the costs involved, to ensure that any wider restocking plan would be as cost effective and efficient as possible. "First, we need to know whether the laboratory-raised prawns would survive in the estuary. Then, we can determine whether the populations can be brought back up to a sustainable level, whether restocking is worth the effort," he said. The $200,000 project, jointly funded by the Fisheries Research Development Corporation (FRDC) and the Swan River Trust, could pre-empt a wider effort to restock the Swan-Canning estuary with prawns. This is a collaborative project, drawing on the expertise of researchers from Murdoch University, Challenger Institute of Technology and the Swan River Trust. Staff from the Swan River Trust are leading the development of a community engagement program, to encourage prawning as a pastime, to allow the public to assist with data collection, and to increase the public's knowledge about prawns and the estuary itself.